- EUR faces a 2019 of moribund price action, Danske Bank forecasts show. - As ECB's retreat from earlier rate guidance will weigh on single currency. - New lows in sight on 1-3 month horizon, recent highs are a 2019 ceiling. The Euro is now facing a year of moribund price action that will see January's highs act as a ceiling over the coming quarters, according to the latest forecasts from Danske Bank, after the European Central Bank (ECB) effectively turned off the music and cut the cord on Thursday. ECB President Mario Draghi said Thursday there was a "sizeable moderation" in the pace of growth last year and that this has carried over into 2019. As a result, the bloc's economy will be slower in producing the expansion necessary for inflation to return sustainably to its target of "close to but below 2%". This led the ECB to come clean with markets in acknowledging that its main interest rates will be slower in rising from their current debt crisis levels. It said Thursday that rates will remain where they are until at least "through the end of 2019", but previous guidance suggested a hike could come in Autumn 2019. 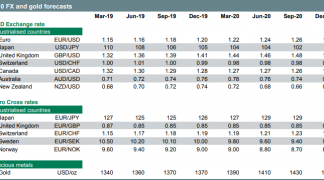 "The ECB’s communication highlights that all policy options are back on the table and – crucially for the FX market – this opens up the range of possible policy outcomes and introduces an ‘ECB easing risk premium’. Importantly, it also postpones the potential for a capital-flow reversal to support EUR, as negative rates will rein in the eurozone for some time still," says Piet Christiansen, an analyst at Danske Bank. Eurozone inflation was 1.5% in February, up from 1.4% previously, but still a long way off the target. Core inflation, which removes volatile energy items from the goods basket in order to provide a better reflection of domestically-generated price pressures, fell 10 basis points to 1% when consensus looked for a reading of 1.1%. That latter measure has not been any higher than 1.2% since the ECB began its record-setting stimulus programme that was intended to lift consumer price growth back to its target level by using an artificial compression of bond yields in order to encourage an economic recovery. The bank needs faster economic growth that is above "potential" in order to get inflation sustainably back to its target level. But the ECB cut its 2019 GDP growth forecast from 1.7% to 1.1% on Thursday, and downgraded the likely 2020 expansion from 1.7% to 1.6%. It now says core inflation will average just 1.2% in 2019 and 1.4% in 2020, down from earlier forecasts of 1.6% and 1.7% respectively. The Euro sold off sharply following the announcement. "The growth revision also left its mark on the (core) inflation outlook, which was lowered by 0.2% across the years," says Christiansen, in a note to clients. "Draghi acknowledged that core inflation has remained muted but stressed that wage growth remains strong with dispersion of nominal wage growth rates across countries at historical lows. Patience remains the mantra about the transmission from wages to consumer prices." Eurozone GDP growth was just 0.2% in the final quarter last year, Eurostat confirmed on Thursday, which means the economy grew by only 1.8% for 2018. That's down from the 2.4% expansion seen in 2017. Changes in inventory investment among companies was the main driver of the downturn in the second half of 2018, the first detailed breakdown of Eurostat figures for the final quarter showed on Thursday. Inventories are goods that have been produced by companies but not yet sold. This drag coming from inventories could have its roots in declining output from the factory sector because industrial production fell steadily during the final three months of 2018 and was down -4.2% for year to the end of December. "The ECB acknowledged that incoming data continued to be weaker than expected, weighing on the near-term outlook but, importantly, it still expects growth rates to pick up towards the end of the year and sees growth at 1.6% back above potential in 2020, on the back of favourable financing conditions and a strong labour market," Christiansen says. 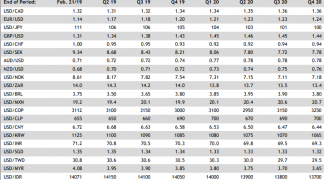 New EU rules governing the process of testing automotive emissions output have hit activity in the car manufacturing sector hard during recent months, contributing to a contraction of the German economy in the third quarter and zero growth in the final quarter. The U.S.-China trade war has also hurt demand for products made in Eurozone factories and driven confidence among companies into the ground of late. But the White House has said it is close to a deal that will end China's "unfair trading practices" and automotive firms are now getting back on their feet. "Interestingly, the ECB projections do not take into account a possible US-China trade deal, so one could argue there remain upside risks to the ECB’s gloomy near-term growth outlook," Christiansen notes. Markets now fully expect the U.S. and China to reach a deal that ends the trade war between the world's two largest economies over the coming months, although few expect the agreement to endure beyond the end of 2020. Many say the deal is designed to protect both economies from further damage ahead of the 2020 Presidential election in the U.S., which means China would get more time to prepare for the next tariff fight. As a result, there may be scope for the Eurozone economy to recover over the coming months, potentially leading markets to warm toward the single currency again. However, there are other risks lurking in the long grass of 2019 that could easily upend any newfound economic stability. "With the risk of pockets of USD strength from renewed pricing of Fed hikes and a trade deal that will not provide much imminent support, this opens the possibility for a EUR/USD move towards 1.10 on a 3M horizon. 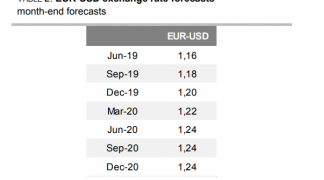 Over the medium term (3-6M out), we expect EUR/USD to stabilise and move back into the 1.12-1.16 range and stress that any drift higher will be limited," says Christiansen. The first and foremost threat to a recovery is of a disorderly British exit from the European Union happening in the coming months. Many analysts say a WTO exit will not happen, but such a thing is the current default outcome for if talks fail so an orderly exit is far from guaranteed. Furthermore, it's now a matter of public record that President Trump holds a report on his desk that claims European car exports are, somehow, a threat to U.S. national security. This gives the White House the only pretext it needs to be able to hit the EU and Eurozone economies with tariffs of up to 25% on any cars imported into America from Europe. As a result, even if an end to the U.S.-China trade war does help lift sentiment toward the Eurozone economy and currency over the coming months, the boost could be limited and might not last unless those latter risks are first addressed. Above: Euro-to-Dollar rate shown at monthly intervals.